When Remakes Are Remade | Critical End! My review aside, there didn’t seem to be much love for Joe Johnston’s 2010 Wolfman remake. You would think that maybe because it won an Oscar and Johnston is now about to release his much anticipated Captain America, it might earn some points, but apparently not. CHUD is telling me that Universal Studios has begun early planning for, you guessed it, another remake of The Wolfman, this time simply titled Werewolf. How imaginative. Add an exclamation mark to that title and you suddenly have a musical version, which I might get excited about. Anyway, CHUD goes on to speculate that this remake is most likely going to be set in modern day, which completely throws out all of the cool gothic style that both the original and the 2010 version worked with so well. I also imagine that this version will be in mind-shattering 3D, which means almost completely CG effects should be expected. 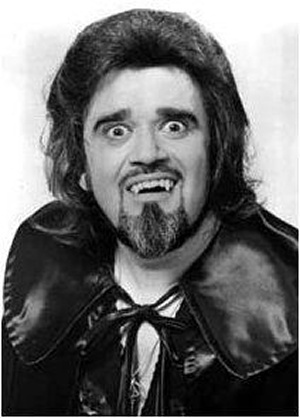 Then again, maybe we’re all wrong about this thing and what Universal is actually doing is finally getting around to that Wolfman Jack biopic. I couldn't resist the urge to use this picture. The Evil Dead? Yeah, I’ll Take That. This entry was posted on Tuesday, July 12th, 2011 at 7:05 am. You can follow any responses to this entry through the RSS 2.0 feed. Both comments and pings are currently closed. What did we do to deserve this, Hollywood? What? WHAT?